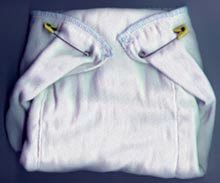 As far as absorbency goes, you might try using two diapers at a time, to increase the absorbency. Then put a fleece liner between the diaper and his skin to keep the wetness away. This is what I do with my son. It makes a HUGE difference! I just got some polar fleece from WalMart, cut it into rectangles (about 6"x16"), and I place one, fuzzy side up (it's one-sided fleece) next to his skin. It keeps him comfortable, while the double-diapering is absorbent enough. I use toddler-size Chinese diaper service quality prefolds. Yes, this is bulky, but it works!